New Member with BMW S1000XR , Its addictive !!!!!!!!!!!!!!!!!!!!!!!!!! I made the mistake of test riding an S1000XR , its all your bloody fault guys !!!!!!!!!!!!!!!! Let me explain ,I got bored between Christmas & news years day so i went to my local BMW dealer & test rode the S1000XR & guess what happened next !!!!!!!!!!! I immediately just did a deal & traded in my 2016 K1600GT for an Matt Ocean Blue 2017 S1000XR ex demo from Lind Motorrad WGC. Givi ST602 Tank lock bag with fully fitted S1101 power hubb & S110 charger. New Sena S10R-01 Bluetooth comms kit from Bike Stop (faulty going back this morning to find out if its gonna be swapped or have to wait for bloody warranty replacement RMA). I have the right to be impatient as its not a cheap piece of kit & I want my toys working out the box especially when I am shelling out left right & centre !!!!!!!!!!!!!!!!! Ok last thing guys , My best mate lives in the US & he is going to come over in June & we are both going to do a two week touring somewhere in Europe. Ok lads that my introduction so Hello & goodbye I am off to Bike Stop in Stevenage now to get this bloody Sena sorted. 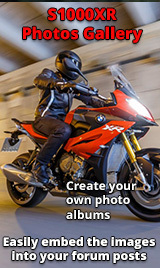 Re: New Member with BMW S1000XR , Its addictive !!!!!!!!!!!!!!!!!!!!!!!!!! Bloody Hell that's some introduction Of course excellent choice of bike ( sorry about the colour ) As for trips so many to contemplate but my favourite would be Ferry down to Santander, a few days around the best roads in Europe ( The Picos ) Then a steady ride up through the Pyrenees and back home via France. Let us Know where you decide to go and how you get on. Vengeance - Congratulations on getting your XR. FYI - I purchased mine in February 2017 (2016 model) and I enjoy it more and more each time I ride it (which is a first for me). When I first got my XR, I didn’t see many around in Southern California, however, in the last 3 months or so, I’ve noticed more and more. Also, in speaking with a BMW dealership, they mentioned that there are “very few” XR’s currently available and that they have quite a few deposits on their yet to be received 2018’s. In addition/ on various occasions I’ve been approached by a few RT/ GS guys wanting to know my feelings/ opinions about the XR (anyway - just saying, but “maybe” the XR could/ might be one of BMW’s top sellers, like its GS? As for accessories (different strokes for different folks), I found that the XR really needs “nothing”. However, to improve it “for me”, I got an MRA windscreen, oil and radiator guard, front fender extender, head light protectors, HP chain adjuster. As for its stock seat, its works perfect for me for all day rides. Also, I’ve got/ had “no real” issues with handlebar vibes, also at 5,500 miles its now even smoother/ works fantastic. I'm sure you will love the bike (a big change from your last one). For your 2wk trip - I would suggest foregoing camping, and go for cheap accommodation with twin-room. Destination - down to South of France (down RDGA and back up RN?) with some time spent down around the Provence Alps. It sounds like you can pack light, but I think camping gear etc will weigh the bikes down, and partially spoil your enjoyment on roads that a bare/lightly-loaded bike is meant for. Your pal will need to sort out travel insurance from USA, as all UK insurers require UK residents as a qualifier, I believe. Whats does this mean mate ? "down RDGA and back up RN"
RN awesome roads and go COLL bagging! On the mirrors I have just ordered some kiwav viper2 google them, convex mirrors so will be better plus they look mean! Will upload pics once they arrive and fitted. Hello and welcome to the forum Vengeance. Wow, you don't waist any time do you. Welcome Vengeance, great introductory email, get stuck in!